A lightweight library to help with training neural networks in PyTorch. Ignite is a high-level library to help with training neural networks in PyTorch. 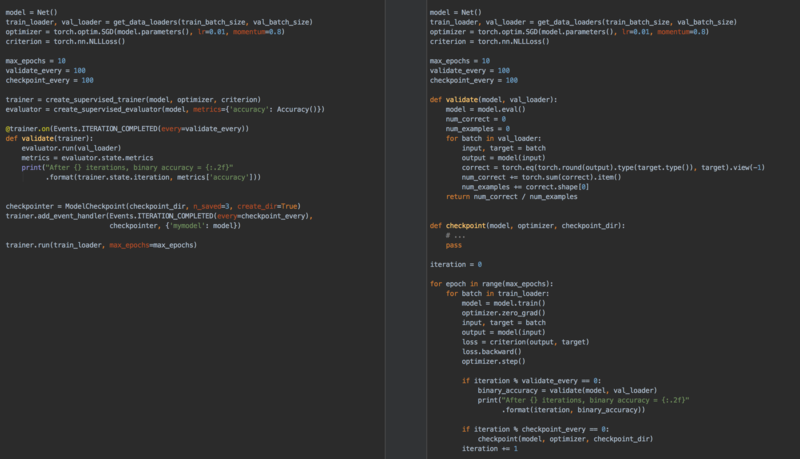 As you can see, the code is more concise and readable with ignite. Furthermore, adding additional metrics, or things like early stopping is a breeze in ignite, but can start to rapidly increase the complexity of your code when “rolling your own” training loop. Ignite’s high level of abstraction assumes less about the type of network (or networks) that you are training, and we require the user to define the closure to be run in the training and validation loop. This level of abstraction allows for a great deal more of flexibility, such as co-training multiple models (i.e. GANs) and computing/tracking multiple losses and metrics in your training loop. Ignite also allows for multiple handlers to be attached to events, and a finer granularity of events in the engine loop. API documentation and an overview of the library can be found here. ignite: Core of the library, contains an engine for training and evaluating, all of the classic machine learning metrics and a variety of handlers to ease the pain of training and validation of neural networks! ignite.contrib: The Contrib directory contains additional modules contributed by Ignite users. Modules vary from TBPTT engine, various optimisation parameter schedulers, logging handlers and a metrics module containing many regression metrics (ignite.contrib.metrics.regression)! The code in ignite.contrib is not as fully maintained as the core part of the library. It may change or be removed at any time without notice. Please check out the examples to see how to use ignite to train various types of networks, as well as how to use visdom or tensorboardX for training visualizations. Please see the contribution guidelines for more information.